Another Friday, another recipe from Dorie Greenspan’s book Around My French Table for French Fridays with Dorie. This week: Sausage-Stuffed Cornish Hens. For me, stuffing is something I only eat at Thanksgiving. There were a few years in college, and right afterwards, when I made StoveTop brand stuffing to accompany chicken or pork chops, but that fell out of the repertoire years ago. For Thanksgiving, I think most families have a traditional stuffing they make, generation after generation, and a recipe that is expected (anticipated? ), without variation, on the menu, year after year. Branching out would probably cause more disappointment than it’s worth. 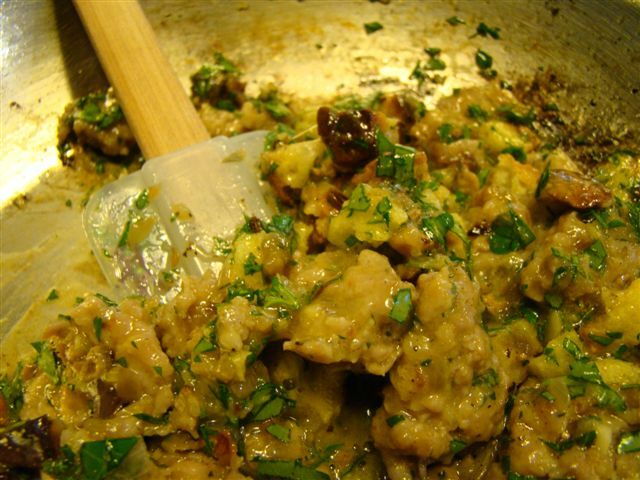 When I make Thanksgiving, I make a bready stuffing with roasted chestnuts, giblets, and lots of herbs. Good thing it is March. I had no qualms about trying out a new stuffing recipe. This one was unlike any I’ve ever made before. There was only a little bread. This was definitely a meaty stuffing. Sweet Italian sausage was the star. Embellished with some sautéed shallots, a little bread, lots of parsley, and an egg to bind it together, the kitchen smelled fantastic. 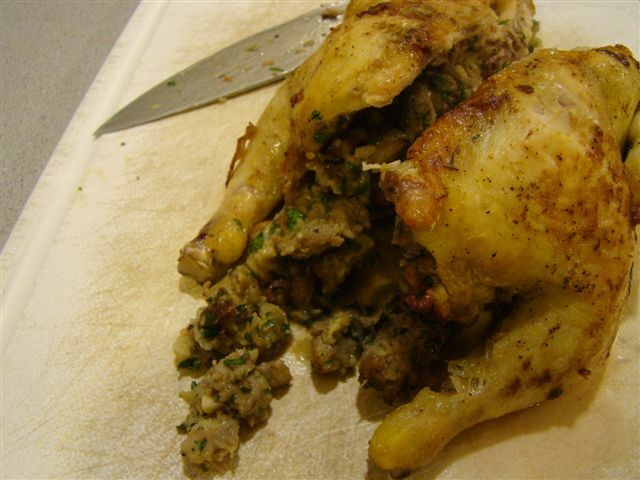 The sausage mixture is stuffed into a Cornish hen before roasting in a cast-iron skillet for just 40 minutes. 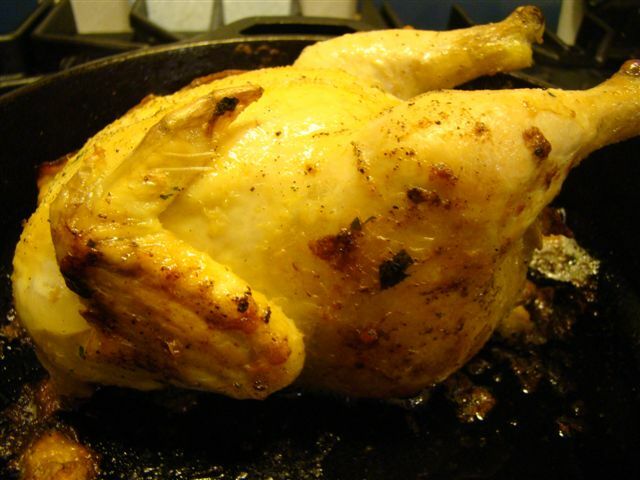 A little on its side, a little more on its other side, and a final roast on its back before letting it take a little nap (a la the Hurry-Up-And-Wait Chicken) while you make a pan sauce from the drippings and some white wine. Howard and I split one hen, so after it was cooked and rested, we (Howard, actually) sliced the hen down the middle and served. I only made one bird, though I made the whole amount of stuffing. (I baked the other half in a ramekin and enjoyed it for lunch.) Our favorite part of this was definitely the stuffing. The poultry-sausage flavor combination was fine. 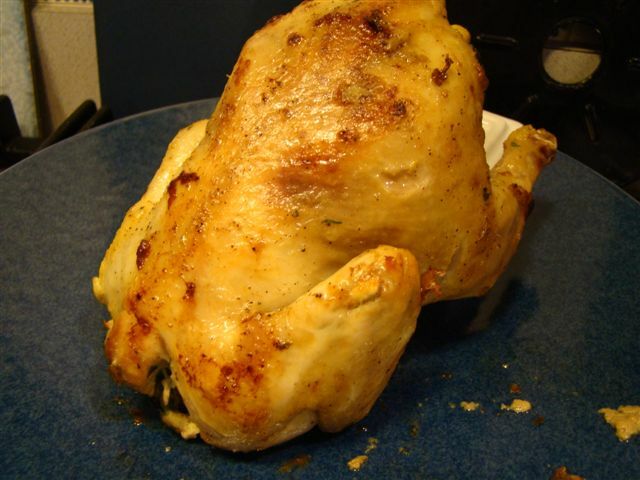 Howard and I both agreed that the meat-to-bone ratio of a Cornish hen makes it much less enjoyable to eat than chicken. Certainly, the hens look cute (weighing in at just 1.5 pounds), but it’s just too fussy to eat. I would make the stuffing again, probably adding a few more slices of bread to make it more of a side, and bake it in a separate dish. Hens, not so much. To see the other Doristas’ verdicts on the hens, check out their links here. Posted on 14 March 2014, in French Fridays with Dorie and tagged Cornish hens, French Fridays with Dorie, sausage. Bookmark the permalink. 14 Comments. So sorry this didn’t pan out to be a recipe worth repeating. Bill would eat these any time! Yes! that stuffing was good! We enjoyed the dressing too (and it heated up very well as leftovers the next day!). My parents have a stuffing recipe that no one dares to mess with (although, I am the only one that won’t eat it) – giblets and gizzards are definitely involved. My husband and son weren’t fans of the bones either. If I make this for them again, I will make one per person and cut the breast out for them and I will devour the rest. I agree, the stuffing is very good. Enjoy the rest of the weekend! This stuffing was new for me, too. I like your idea to add more bread to make it more of a side dish. I also enjoyed the stuffing! Bill and I both loved digging into our little birds. Your hen looks delicious…sorry it wasn’t such a hit for you and Howard! Have a great weekend, Betsy! Very true. I too only eat stuffing once a year, on Thanksgiving. The problem I have is that the stuffing is one of my favorite parts of the Thanksgiving menu, and unfortunately, one that I can’t seem to master. My father makes delicious stuffing, but mine always comes out dry and uninspiring. So maybe I need to start making it more often to try to get it down. This one was good, but a little too meaty for me. I would add stuffing in the future, but probably not quite as much. It was great stuffing wasn’t it. I have never used sausage in stuffing before but would again. Dear Betsy, your Cornish hen has such a great color – the skin looks perfectly roasted and it all looks delicious – these are rather small that´s true but the stuffing sounded wonderful and since I was waiting for my Cornish hens to make an appearance at my local butcher shop, I decided to stuff large mushrooms with the stuffing and grilled them – they were absolutely delicious. Hope you are enjoying a wonderful Sunday! 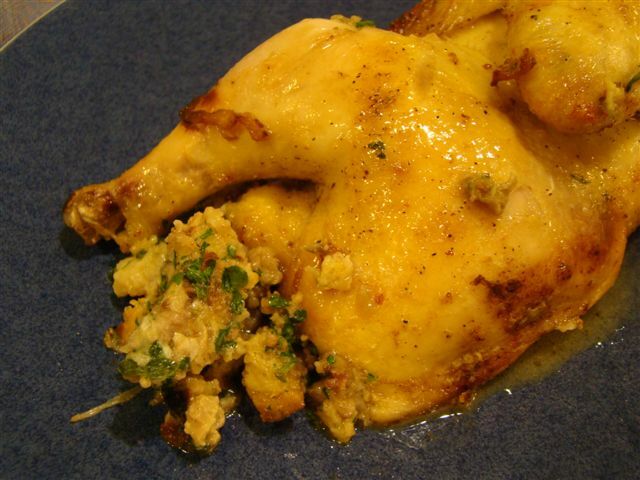 is a small chicken, I do not really care for the flavor, but I loved the stuffing. Your hen has a nice coloring to it, really perfect. Yours look delicious! Hope your weekend is great!! Yes, the stuffing is a winner. I too have memories of Stovetop in my early married years but luckily I have not been a recent user. And while this sausage stuffing happens to be a family tradition, I still enjoyed having it in March. As you said, stuffing is a big deal from generation to generation and can be a key memory to holidays. Not worth messing with. Since I could literally eat this stuff out of the pan because it smells so good (seriously, you have to try it with pignoli nuts added – it is insane) it is probably for the best that I don’t make it too often :) I am also definitely going to try this with large chicken breasts, though, since I do think it would make an amazing dish for company. I see what you’re saying about the hens. They’re a lot of work for a small amount of meat. I’m glad you enjoyed the stuffing, at least.